A varied group of plants Acalypha are grown both for the foliage and the flowers depending on the species. They are frost tender so are better suited to warmer climates or for growing in contiiners on patios or in hanging baskets where they can get some protection. These plants are related to Euphorbias and a number of varieties are well known by their common names. Although they love the warmth, they also thrive in fairly dry conditions. Some are large growing and can be used as a low hedge or screen, others make good container plants. In warmer climates species such as Acalypha wilkesiana can make a great tropical hedge. Acalphya can be pruned to maintain a compact shape. Acalypha inferno ‘Firestorm’ with its great red foliage is a great contrasting specimen in front of evergreen shrubs. These are a fast growing plant and will thrive in warmer climates outdoors. They prefer a humus rich soil and althougth they cope with dry soils, they do perform better in moist but well drained soils. In colder climates they need to grown in a protected position, or in a conatiner and moved indoors during winter. Fertilize with a slow release organic fertilizer in spring, and again in early summer. Acalphya are a tropical to sub tropical plant grown for their foliage as well as the flowers. Acalypha wilkesiana is a fast growing species with large red/bronze leaves, also known as the ‘Fijian Fre Plant’. Acalphya work well in the tropical border. Acalypha godseffiana is commonly sold as ‘Frestorm’ a wonderful foliage plant. 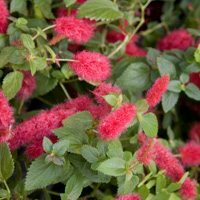 Acalypha hispida or ‘chenille plant’ with its bright red hanging catkins will grow to 4- 5 m and makes a great background plant. Acalypha lyonsii is known as the native Acalypha.